Applications to Art Brussels 2016, the contemporary art fair in Europe’s most upcoming and exciting art city, are open until 15 October 2015. Next year’s fair promises to be an exceptional edition with exciting changes ahead. After a 17-year collaboration with Brussels Expo, Art Brussels will change location and move to the heart of the city in 2016. The fair will take place in the spectacular landmark building of Tour & Taxis, a customs house from the turn of the 20th century, situated in Brussels’ vibrant inner-city area, in thehub of its artistic heart. With the move to its magnificent new location, Art Brussels continues to evolve, with a view to retaining its cutting-edge character. At the same time, the move to Tour & Taxis enables the fair to prize quality above quantity. The size of the fair will be reduced from 191 to no more than 140 galleries. Brussels continues to be a pole of attraction for increasing numbers of international artists, galleries and curators, solidifying Brussels’ reputation as one of Europe’s most interesting and up-and-coming contemporary art cities. This enables Art Brussels to offer a rich and diverse VIP programme for collectors and art professionals. REDISCOVERY will be a new section at Art Brussels 2016, complementing the development of the fair’s existing DISCOVERY profile. The section will be dedicated to art produced between 1917 and 1987, presenting artists that have been underestimated, unappreciated or overlooked. Next to that, Art Brussels will present 30 galleries in DISCOVERY, a section focused on the work of emerging artists presented by younger galleries. PRIME will feature work of better-known, prominent artists represented by established galleries and SOLO will highlight presentations of work by a single artist. The International Gallery Committee members, for the selection of galleries in PRIME and REDISCOVERY, are: Augusto Arbizo, 11 Rivington Gallery (New York) / Albert Baronian, Galerie Albert Baronian (Brussels) / Michael Callies, dépendance (Brussels) / Claudia Cargnel, Bugada & Cargnel (Paris) / Simon Devolder, Xavier Hufkens (Brussels) / Katerina Gregos, Curator, Artistic Director Art Brussels / Rodolphe Janssen, Rodolphe Janssen (Brussels) / Thomas Krinzinger, Galerie Krinzinger (Vienna) / Andrew Renton, Marlborough Contemporary (London). The DISCOVERY Committee, for the selection of the DISCOVERY section consists of a group of international curators and gallerists: Michael Callies, dépendance (Brussels) / Aaron Cezar, Director Delfina Foundation (London) / Zoë Gray, Senior Curator, Wiels (Brussels) / Katerina Gregos, Curator, Artistic Director Art Brussels / Nikolaus Oberhuber, KOW Gallery (Berlin). The selection of the SOLO presentations and of the nominees for the SOLO Prize is made by Katerina Gregos—Curator, Artistic Director Art Brussels. Though it retains its youthful profile as a discovery fair, Art Brussels is one of Europe’s oldest and most established fairs. Founded in 1968 as Art Actuel, it was conceived by a small group of well-respected Belgian gallerists who each invited a gallery from abroad to exhibit. In its first years the fair had a nomadic character, moving between locations as diverse as the Casino in Knokke (1972) to the Palais des Beaux-Arts in Brussels (1976). In 1989 the fair moved to the former Expo ’58 premises in Heyzel, where it remained until last year. 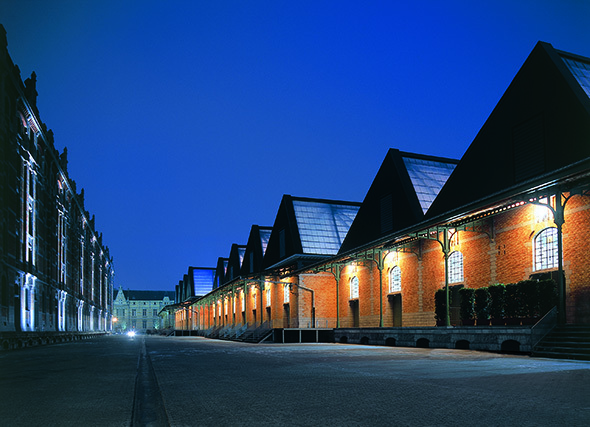 It was managed by the non-profit Association of Belgian Contemporary Art Galleries until 1997, at which time it was bought by the Artexis-Easyfairs group, active in multi-format venues and events business at an international level. Since its inception, Art Brussels has evolved into a must-see international contemporary art fair, and one of the top European art fairs.